The Datamax W-Class has been renamed to the Datamax-O'Neil W-Class. The Datamax W-Class thermal barcode printer family was designed to address the specialized printing needs of applications where wide label formats are industry-standard requirements. The W-Class product family consists of the DMX-W-6208, the W-6308, and the W-8306. 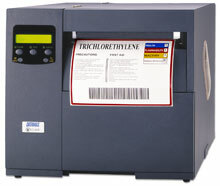 W-Class wide-format label printing products are the most advanced of their kind in the marketplace today. The W-Class features more standard memory, a beefier processor, and the scalability required in today's connected workplace. The W-Class utilizes the acclaimed electronics features of the industry-leading Datamax I-Class product line, including a card cage with the option to add electronics accessories on-site. W-Class printers are constructed to endure the most intense industrial printing environment, with an all-metal chassis and heavy-duty metal exterior designed to protect the value of your technology investment. Thermal transfer, 300 dpi, 6 ips, 8.5" print width, parallel & serial interfaces, 16MB DRAM, 2MB flash. Includes US power cord. Order cables separately. See accessories. Thermal transfer, 300 dpi, 8 ips, 6.4" print width, parallel & serial interfaces, 16MB DRAM, 2MB flash. Includes US power cord. Order cables separately. See accessories. Thermal transfer, 203 dpi, 8 ips, 6.61" print width, parallel & serial interfaces, 16MB DRAM, 2MB flash. Includes US power cord. Order cables separately. See accessories. Thermal transfer, 300 dpi, 6 ips, 8.5" print width, parallel & serial interfaces, 16MB DRAM, 2MB flash. Includes rewinder & US power cord. Order cables separately. See accessories. Thermal transfer, 300 dpi, 6 ips, 8" print width, Ethernet, parallel & serial interfaces, 16MB DRAM, 2MB flash. Includes US power cord. Order cables separately. See accessories. 3.5" x 1" Direct thermal paper label. 1,375 labels/roll, 8 roll case. 3" x 3" Direct thermal paper label. 500 labels/roll, 8 roll case. 4" x 6" Direct thermal paper label. 250 labels/roll, 8 roll case. Also available as a single roll (Part# 350970-R).